A "groundbreaking" cystic fibrosis therapy could profoundly improve patients' quality of life, say doctors. Patients often die before their 40s as mucus clogs and damages their lungs and leaves them prone to infection. A major trial on 1,108 patients, in the New England Journal of Medicine, showed a combination of drugs could bypass the genetic errors that cause the disease and may increase life expectancy. 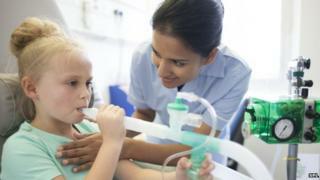 The Cystic Fibrosis Trust said it could "improve the lives of many". One in every 2,500 babies in the UK has cystic fibrosis. Errors in sufferers' DNA - inherited from their parents - damage the microscopic machinery that controls salt and water levels in the linings of the lungs. The result is a thick mucus that inexorably damages the lungs. Antibiotics help prevent infection and drugs can loosen the mucus, but nothing deals with the fundamental problem for most patients. The combination of drugs - lumacaftor and ivacaftor - were designed to repair that microscopic machinery. The trial showed that those patients given the cocktail for 24 weeks had better lung function. Cystic fibrosis also affects the mucus lining in the gut so the doctors were pleased to see the patients also gained weight in the trial. Prof Stuart Elborn, who led the European part of the trial from Queen's University Belfast, told the BBC News website: "This is very exciting and it really demonstrates that we can correct the basic defects in cystic fibrosis. "This is likely to become a fundamental treatment for cystic fibrosis. "Starting in children may prevent the disease process developing if we correct the basic defect early in life. "Will this improve survival for people with cystic fibrosis? We would anticipate it would have a really good chance of doing that, but we don't know for sure yet." There are however, many types of error in the DNA that can culminate in cystic fibrosis. This treatment combination should work on around half of patients, while one of the drugs on its own corrects a small proportion of errors. New treatments are still required for the remaining patients. Susanna McColley, professor of paediatrics at Northwestern University, said these were "groundbreaking findings" that showed the future of treating cystic fibrosis. She told the BBC: "For subjects I've cared for, they felt better in ways that are not necessarily measurable. "One young woman said, and this is a direct quote, her CF 'is not a problem'." Janet Allen, the director of research at the Cystic Fibrosis Trust charity, said: "These results open up a new front in the fight against cystic fibrosis and this combination therapy looks set to be an important additional treatment option that could improve the lives of many. "As this leading edge of science continues to be explored and better understood, we are hopeful that a future of personalised medicines is increasingly within reach." The therapy is being examined by regulators around the world.